At the very heart of the nature of the crisis facing the Church Militant at this time is the extent of papal infallibility and the extent to which a Catholic can "correct" a validly reigning pontiff on matters of Faith and Morals. Those in the "resist and recognize" camp have made arguments over the years that it is possible to resist a validly reigning pontiff for years on end while recognizing him as a true and valid Successor of Saint Peter. Indeed, I was part of that "resist and recognize" camp even in my "indulterer" days throughout the 1990s as I swatted away at this or that "papal" decision by relying upon the perennial teaching of the Catholic Church. One man from Missouri wrote to me at the end of 1996 to accuse me of being a "practical sedevacantist" because of my reliance upon the great social encyclical letters of the preconciliar popes while ignoring such "encyclicals" as Angelo Roncalli/John XXIII's Pacem in Terris and Giovanni Montini/Paul VI's Populorum Progressio. I never responded to the letter-writer as I knew that he had a valid point, one that I preferred at the time not to dwell upon too much. I was committing the Gallican error of "picking and choosing" which "papal" decrees and statements and decisions were Catholic and which ones were apostate--or at least erroneous and ill-advised. One of the great mercies that God extends to us erring sinners (and behold an erring sinner if ever there was one!) is to permit us to live long enough to correct our mistakes. As I noted in Defending the Truth is Never Any Kind of Game four months ago now, it is not possible for a member of the Catholic Church to "pick and choose" which decisions and decrees of the Roman Pontiff he is going to accept. He must submit to the authority of the Roman Pontiff, a submission that has undermined by the novel ecclesiology that has been propagated by the Society of Saint Pius X in the past thirty-eight years to attempt to justify public resistance to the men whom its leaders have recognized as the legitimate Successors of Saint Peter while establishing what can be called a veritable rival "magisterium" that sits in judgment on the decrees and decisions of these "popes." Although I was "late" to come to accept the truth that a legitimately reigning pontiff cannot give us error in contravention of the defined teaching of the Catholic Church and cannot impose disciplinary laws that are evil and thus offensive to God and contrary to the eternal good of souls, I have recognized for most of the past two years now that the "resist and recognize" approach to the papacy is erroneous and reduces the scope of the infallibility of Holy Mother Church's Ordinary Magisterium to something that none of the Fathers of the Church would recognize or accept. A legitimately elected and reigning pontiff has the right to bind Catholics with what he teaches and to impose upon them liturgical and disciplinary regulations from which no Catholic may choose to exempt himself or dare to serve as the ultimate arbiter as to which papal decree or allocution or encyclical letter or regulation he believes is consonant with the perennial teaching and traditional practice of the Catholic Church. Father Anthony Cekada has handled this very well in his Resisting the Pope, Sedevacantism and Frankenchurch, which I very much recommend to be read in full. Here is but a brief passage to illustrate the simple Catholic truth that we do not get to "pick and choose" which papal decrees and regulations we "like" and thus consider ourselves bound under penalty of sin to obey, if not "duty bound" to "resist" publicly:"
In my experience, the average layman who adheres to R&R [resist and recognize] does so based on the notion that Catholics are really bound only by “ex cathedra” pronouncements, that neither the New Mass nor the Vatican II errors fall under this heading, and that Catholics are therefore free to reject and denounce these things as non-Catholic, as well as to “resist” the various popes who promulgated them. “If anyone says that the ceremonies, vestments and outward signs, which the Catholic Church uses in the celebration of Masses, are incentives to impiety rather than the service of piety: let him be anathema. (1) Teachings of the Universal Ordinary Magisterium. One way this magisterium is exercised is “by the express teaching habitually imparted, outside of formal definitions, by the pope and the body of bishops dispersed throughout the world. By this standard, for instance, the 1994-1997 Catechism of the Catholic Church contains “universal ordinary magisterium” for those who recognize John Paul II as a true pope. He explicitly declared the Catechism “a sure norm for teaching the faith,” “a sure and authentic reference text for teaching Catholic doctrine… to assist in the writing of new local catechisms… while carefully preserving the unity of faith and fidelity to Catholic doctrine." Yet traditionalists who read SSPX publications, The Remnant, Catholic Family News, etc. know that the Catechism is filled with doctrinal error, because it promotes the Vatican II teachings on religious liberty, ecumenism, collegiality, the Church, etc. (2) Doctrinal Decrees of the Holy See. These include doctrinal statements published by the Holy Office with the pope’s approval, as well as papal encyclicals. Catholics must give all authentically-approved papal doctrinal decrees “internal mental and religious assent,” given “out of reverence due to God, who governs through the sacred hierarchical authority of the Church." Here too, publications put out by the R&R camp have pointed out that this document and others like it contain doctrinal errors about the Church, salvation, etc. But again, one cannot reconcile the existence of doctrinal errors found in either source (presumed universal ordinary magisterium or papal doctrinal decrees) to the notion that a true pope and Catholic bishops, retaining teaching authority from Jesus Christ and the assistance of the Holy Ghost, imposed doctrinal error on the universal Church. St. Thomas and other observe that St. Paul gave an example of how subjects should give fraternal correction to their prelates “even publicly,” if they commit a crime that is public, scandalous and a danger to the faith. This is standard teaching in moral theology manuals. The principle, however, applies only to fraternal correction. No theologian I know of extends it to rejecting a pope’s universal disciplinary laws or teachings of his universal ordinary magisterium. The theologian Suarez, in fact, says that neither Gal 2:11-14 nor Mt 18:1. allow “fraternal correction” of a pope through public denunciation of his crime. • These passages justify nothing more than disobeying a pope’s evil commands (“Sell Fatima to Disney, Monsignor, dynamite St. Peter’s and then bring me another blonde chorus girl…”), but NOT resisting his universal law (which are infallible) and the universal ordinary magisterium of pope and bishops (also infallible). • Because the R&R-ers have not examined the context of their “proof-texts,” they mistakenly conclude that the authors were approving “resistance” to a pope by individual Catholics. But in fact the quotes were part of the Catholic argument against the theories of the conciliarist theologian Gerson (1363-1429 regarding how much a general or provincial council of bishops or a Catholic king could either “correct” or “resist” a morally evil pope —one who, like some Renaissance popes, sold ecclesiastical offices, appointed unworthy office-holders, irresponsibly granted dispensations, and thus “manifestly destroyed the Church." “Proposition 23: ‘It would not seem permitted for any private person on his own authority to resist and not obey the Pope’s directives, however much these would contradict a Council’s decision.’ This is correct. For it would be a great act of irreverence and near-contempt for supreme authority if anyone were allowed to act towards a Pope in a way that would not be permitted towards a bishop, whose directive (however unjust) one may not disobey on private authority." The evils and errors most traditionalists acknowledge, in other words, are solid evidence that the lawgivers lost their authority. Sedevacantism merely tries to explain how. Here, Catholic theology and canon law tell us that while the Church herself cannot defect from the faith, an individual member who holds Church office can. If he defects publicly, he automatically loses his office (authority). This principle applies even to a pope. Since the 16th century nearly all canonists and theologians who have addressed the issue teach that a pope who becomes a manifest (public) heretic “would, by divine law, fall from office without any sentence." Father Cekada provided an excellent review of the "resist and recognize" errors in a sermon given on July 9, 2006 (The Errors of the Society of St Pius X.) His Excellency Bishop Mark A. Pivarunas has done so in the lecture he delivered at the Fatima Conference at Mount Saint Michael's Academy on October 13, 2006 (Oct. 13 Bishop Pivarunas “Sedevacantism Part I”, Part II, Part III”, Part IV”). Helpful articles by His Excellency Bishop Donald A. Sanborn include Resistance and Indefectibility and The Mountains of Gelboe, among many others listed at Traditional Mass. In plain English, you see, at the heart of the whole crisis facing the Church Militant on earth right now is whether Joseph Ratzinger is indeed a true Successor of Saint Peter. If he is, then Catholics must, as Father Cekada pointed out so extensively, submit to his governance with docility. There has never been a circumstance in the history of the Catholic Church where individuals, both in the clergy and in the laity, have acted on almost universal basis throughout the world as a sort of "super magisterium" to monitor the correctness of papal decrees and decisions. Sure, there have been instances of this confined to various regions at one point or another, which is why Pope Pius VI condemned the illegal Synod of Pistoia and its tenets in Auctorem Fidei, August 28, 1794. However, there has never been a period before in the history of the Catholic Church in which one pope after another has contradicted the past dogmatic decrees and dared to commit one blasphemy after another against the honor and majesty and glory of God. One must come to recognize that such apostasy and blasphemy is not of God and that it cannot come from the Catholic Church. It took me long enough to "get it" despite entreaties made by one person after another dating back to November 25, 1976. Men who speak and act as the conciliarists have done have expelled themselves from the Catholic Church. Millions upon millions of Catholics gave up their lives rather than even to give the appearance of the sort of blasphemies that have become commonplace in the counterfeit church of conciliarism. To be quiet in the face of such apostasy and blasphemy and betrayal is to betray Our Blessed Lord and Saviour Jesus Christ and the true Church that He founded upon the Rock of Peter, the Pope. It is to defend the very integrity of the papacy that those courageous priests who recognized that the conciliar claimants to the Throne of Saint Peter could not be true popes and that the Catholic Church cannot give us evil or defective liturgical rites took the measures that they did in the 1970s and the 1980s to attempt to correct the erroneous Gallican view of papal infallibility that was being propagated by the Society of Saint Pius X and that has spawned several generations of imitators across the ecclesiastical divide. These courageous priests spoke out. They acted. They defended the Catholic Faith. They would resist apostasy without acknowledging for one moment or by any act of omission that those promoting said apostasy could hold ecclesiastical office validly and exercise doctrinal authority in the name of the Catholic Church. 1. The commitment to a response proportionate to the generosity of the Pope. 2. The commitment to avoid every public intervention which does not respect the person of the Holy Father and which may be negative to ecclesial charity. 3. The commitment to avoid the claim to a Magisterium superior to the Holy Father and to not propose the Fraternity in contraposition to the Church. 4. The commitment to display the will to act honestly in full ecclesial charity and in respect for the authority of the Vicar of Christ. 5. The commitment to respect the date - fixed for the end of the month of June  - to respond positively. This shall be a condition necessary and required as an immediate preparation for adhesion to accomplish full communion. 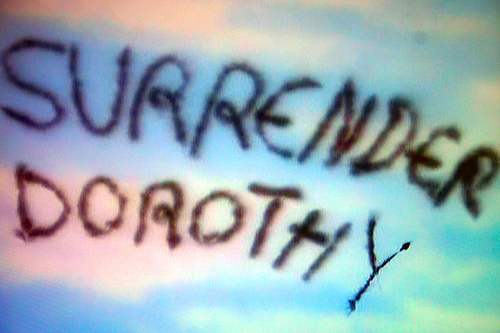 In other words, "Surrender Dorothy!" Leaving aside the date by which this ultimatum must be accepted, the terms offered by the Dario Castrillon "Cardinal" Hoyos, the President of "Pontifical" Commission Ecclesia Dei, are thoroughly Catholic. Remember, the conciliarists have always known how to play the "obedience card" to their advantage when they have wanted to so, as I will explain more in a moment. Just as social revolutionaries have known how to appeal to "patriotism" to quell opposition to their plans when outside forces are threatening to overturn their revolutions, the conciliar revolutionaries have known how to appeal to thoroughly Catholic principles in order to obtain what Catholics must give to a validly reigning pontiff: submission and obedience. Catholics have no freedom to criticize a validly reigning pontiff. The demands made in "Cardinal" Hoyos's letter to Bishop Fellay are thus completely valid. And a Catholic possessed of the sensus Catholicus would indeed submit in a heartbeat IF the claimant to the papal throne was indeed a member of the Catholic Church who had not expelled himself from her maternal bosom by defecting from the Faith. As Father Cekada noted in Resisting the Pope, Sedevacantism and Frankenchurch, we know that the decrees and statements and actions of the conciliar "pontiffs" are contrary to the Faith, thus gravely offensive to God and harmful to souls. Those who don't accept this as true can live happily ever after with clown "Masses" and the "papal" esteeming of the symbols of false religions. Those who do recognize the words and actions of the conciliar "pontiffs" as antithetical to the Faith must come to the inevitable conclusion that these claimants are imposters whose very philosophical underpinnings and specific positions on doctrinal matters were condemned by Pope Pius IX in The Syllabus of Errors and by Pope Saint Pius X in Lamentabili Sane and Pascendi Dominci Gregis and Praestantia Scripturae and by Pope Pius XII in Humani Generis. Why do you think that Joseph Ratzinger/Benedict XVI is having "Cardinal" Hoyos invoke true Catholic principles to silence any future criticism of the "Second" Vatican Council and the Protestant and Masonic Novus Ordo service and the decisions and decrees and actions of the conciliar "pontiffs," including himself? It is because he knows full well that he has written in the past and is speaking and acting at present in ways that have been condemned by the authority of the Catholic Church. He wants no one to undermine his effort to circumvent the contradictions posed by his words and actions, which is why he is using the "game plan," if you will, of his own "New Theology" to attempt to make the Fathers of the Church into being "witnesses" in behalf of conciliarism. There must be silence from traditionally-minded Catholics attached to the structures of the counterfeit church of conciliarism about these contradictions that pertain to the nature of truth and thus the very nature of God Himself as the price for their "full citizenship" in those structures. This silence has been won over the years by means of the "indults" of 1984 and 1988. Summorum Pontificum bought even more silence last year as some Catholics afraid to "lose the Mass" do not even consider it at all opportune to defend the honor and glory and majesty of the Most Blessed Trinity as their "pontiff" esteems very publicly the symbols of false religions and as efforts to appease the ancient enemies of the Church from the quarters of Talmudic Judaism are made repeatedly. We are now at the moment when Joseph Ratzinger/Benedict XVI wants to deliver the coup de grace to any well-organized body of traditional "resistance" to his revolutionary agenda, founded as it is in a complete and utter rejection of the official philosophy of the Catholic Church, the Scholasticism of the Angelic Doctor himself, Saint Thomas Aquinas. Although God may console Us with you, We are nonetheless sad. This is due to the numberless errors and the teachings of perverse doctrines which, no longer secretly and clandestinely but openly and vigorously, attack the Catholic faith. You know how evil men have raised the standard of revolt against religion through philosophy (of which they proclaim themselves doctors) and through empty fallacies devised according to natural reason. In the first place, the Roman See is assailed and the bonds of unity are, every day, being severed. The authority of the Church is weakened and the protectors of things sacred are snatched away and held in contempt. The holy precepts are despised, the celebration of divine offices is ridiculed, and the worship of God is cursed by the sinner. All things which concern religion are relegated to the fables of old women and the superstitions of priests. Truly lions have roared in Israel.With tears We say: "Truly they have conspired against the Lord and against His Christ." Truly the impious have said: "Raze it, raze it down to its foundations." Among these heresies belongs that foul contrivance of the sophists of this age who do not admit any difference among the different professions of faith and who think that the portal of eternal salvation opens for all from any religion. They, therefore, label with the stigma of levity and stupidity those who, having abandoned the religion which they learned, embrace another of any kind, even Catholicism. This is certainly a monstrous impiety which assigns the same praise and the mark of the just and upright man to truth and to error, to virtue and to vice, to goodness and to turpitude. Indeed this deadly idea concerning the lack of difference among religions is refuted even by the light of natural reason. We are assured of this because the various religions do not often agree among themselves. If one is true, the other must be false; there can be no society of darkness with light. Against these experienced sophists the people must be taught that the profession of the Catholic faith is uniquely true, as the apostle proclaims: one Lord, one faith, one baptism Jerome used to say it this way: he who eats the lamb outside this house will perish as did those during the flood who were not with Noah in the ark. Indeed, no other name than the name of Jesus is given to men, by which they may be saved. He who believes shall be saved; he who does not believe shall be condemned. If Joseph Ratzinger is the Vicar of Christ, then one must submit to his authority and to recognize his actions and words and decrees as coming from the very One Whose Vicar he claims to be. This would mean, however, that the jaws of Hell have prevailed against the Church as Our Lord would have to permit the official organs of what claims to be His Catholic Church on earth to contradict the dogmatic councils and true popes of the past. If Joseph Ratzinger has indeed defected from the Catholic Faith throughout his priesthood, then it is time for the bishops and the priests of the Society of Saint Pius X to adopt a new "r and r" agenda, that is, to refuse to recognize apostates as members of the Catholic Church who can hold ecclesiastical office legitimately. That would mean, of course, having to admit that the "nine" were correct. What the bishops and the priests of the Society of Saint Pius X will decide remains to be seen. One of the reasons that some priests of the Society of Saint Pius X told me that they could not embrace sedevacantism was that to do so would be to betray the late Archbishop Marcel Lefebvre, certainly a courageous apostle of Christ the King but not possessed of the charism of personal infallibility. It would be, however, precisely to betray the Archbishop's well-intentioned and eloquent attempts to defend the Faith to agree to silence in the face of the apostasies and blasphemies that are at the very foundation of conciliarism. And much more to the point, it would be to betray Christ the King either to accept silence or to continue to promote a false ecclesiology that makes of the papacy nothing more than a cardboard figure, as Father Cekada has noted so well in his writings. Is God pleased when that same putative "pontiff" takes off his shoes and enters into a mosque and then assumes a Mohammedan prayer position? Is God pleased with a man believing himself to be the Successor of Saint Peter permits himself to be treated as an inferior in one mosque and two synagogues? Did God really permit the true popes of past centuries to be wrong in the praise they lavished the Angelic Doctor whose philosophy, Scholasticism, is deemed by Joseph Ratzinger/Benedict XVI to be "too closed in on itself"? Does God want the clarity of Scholasticism replaced with the contradiction and the paradox of the New Theology? Joseph Ratzinger/Benedict XVI believes that the answer to each of these questions is in the affirmative. Do you? If you don't, how can one say that God is pleased with Joseph Ratzinger/Benedict XVI and his public acts in defiance of His very honor and majesty and glory as His own nature is undermined by the attack on the nature of truth and being that is at the foundation of Modernism and its progeny, conciliarism? Is God indifferent to apostasy and betrayal? Stipulating that not one of us who has been able to extricate himself from the errors of the "resist and recognize" camp is one whit better than any other Catholic, we must nevertheless continue to give thanks to Our Blessed Lord and Saviour Jesus Christ and His Most Blessed Mother for helping us to accept the truth. Those who do see the truth of our ecclesiastical situation are few in number. Very, very few in number. So what? So what? How many Apostles were at the foot of the Cross on Good Friday? How many bishops in England remained faithful to the Church when King Henry VIII broke from Rome in 1534? One in both cases. The fact that any of us have "gotten it" is the result of the graces won for us by the shedding of every single drop of Our Blessed Lord and Saviour Jesus Christ's Most Precious Blood on the wood of the Holy Cross and that flow into our hearts and souls through the loving hands of Our Lady, the Mediatrix of All Graces. It is easy to give up the fight. It is easy for us "Dorothies" to "surrender" to the forces of wickedness who dare to mock God by placing into question the nature of His truth and who dare to blaspheme Him by esteeming the symbols of false religions. We must, of course, make reparation for our own sins, which are responsible in no small measure for worsening the state of the Church Militant on earth, and for those of the whole world as we pray as many Rosaries each day as our states-in-life permit. The final victory belongs to Christ the King through the Sorrowful and Immaculate Heart of Mary. We can plant a few seeds for this triumph by continuing to adhere to true bishops and true priests in the Catholic catacombs where no concessions at all are made to conciliarism or to the nonexistent legitimacy of its false shepherds.